A few years ago I fell in love with the television show Call the Midwife that was playing on PBS. It plays in the same season as my guilty pleasure Downton Abbey and it was a great weekly viewing companion. After the first season I really wanted to read the memoir that the series is based on, but as a book reviewer with a mountain of review copies to get through I just felt guilty about picking it up. So I've enjoyed an number of seasons of 1950s midwives in London's East End. Much to my great delight, the audio version of the memoir became available through my public library's digital download site. I snatched it up right away and LOVED every minute of it. Nicola Barber was a wonderful narrator. Often when I listen to audio books where I've seen the movie or television show I'm confused by the different voice. But that wasn't the case with Call the Midwife. The show always carries a graphic content warning and if you haven't seen the show it is GRAPHIC. It makes you very thankful for modern medicine. Though the 1950s weren't that long ago, medicine has come a long ways since then. It also makes me feel okay about never giving birth. In this instance the show is totally faithful to the book. Jenni's descriptions are super detailed. I wish I had the text so I could share her description of the clinic on hot days with dirty bodies and vaginal discharge odors. I was equal parts shocked and disgusted by the level of detail and the images it created in my mind. While the show is pretty faithful to the book there are some story lines that have been combined so I did have a couple of "that's not how the story goes" moments. I loved all the extra background information provided by the book. I remember the scene in the show where the woman is scrubbing the floor and thinks she is in the work house again. In the book, there is a whole lot more about this woman and about work houses. 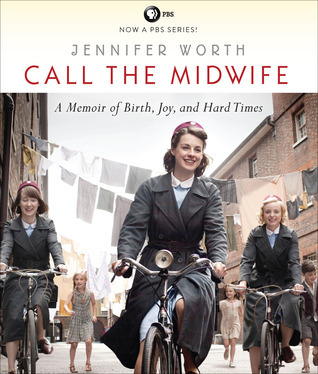 Call the Midwife isn't just a memoir of Jennifer Worth's life, but the lives of those she met along the way. The later seasons of Call the Midwife have had me in tears with just about every episode. While I didn't cry with the book, it still tugged at the heartstrings. If you are a fan of the show, I definitely recommend reading Call the Midwife. Even if you haven't watched the show, you should read it - your life will be enriched.